Studies on the tissue culture of apple have allowed for molecular, biotechnological and applied breeding research to advance. In the past 8 years, over 100 papers advancing basic biology, genetic transformation and cryobiology have emerged. Apple (Malus × domestica Borkh. ; Rosaceae) is an important fruit crop grown mainly in temperate regions of the world. In vitro tissue culture is a biotechnological technique that has been used to genetically improve cultivars (scions) and rootstocks. This updated review presents a synthesis of findings related to the tissue culture of apple and other Malus spp. between 2010 and 2018. Increasingly complex molecular studies that are examining the apple genome, for example, in a bid to identify the cause of epigenetic mutations and the role of transposable elements in this process would benefit from genetically stable source material, which can be produced in vitro. Several notable or curious in vitro culture methods have been reported to improve shoot regeneration and induce the production of tetraploids in apple cultivars and rootstocks. Existing studies have revealed the molecular mechanism underlying the inhibition of adventitious roots by cytokinin. 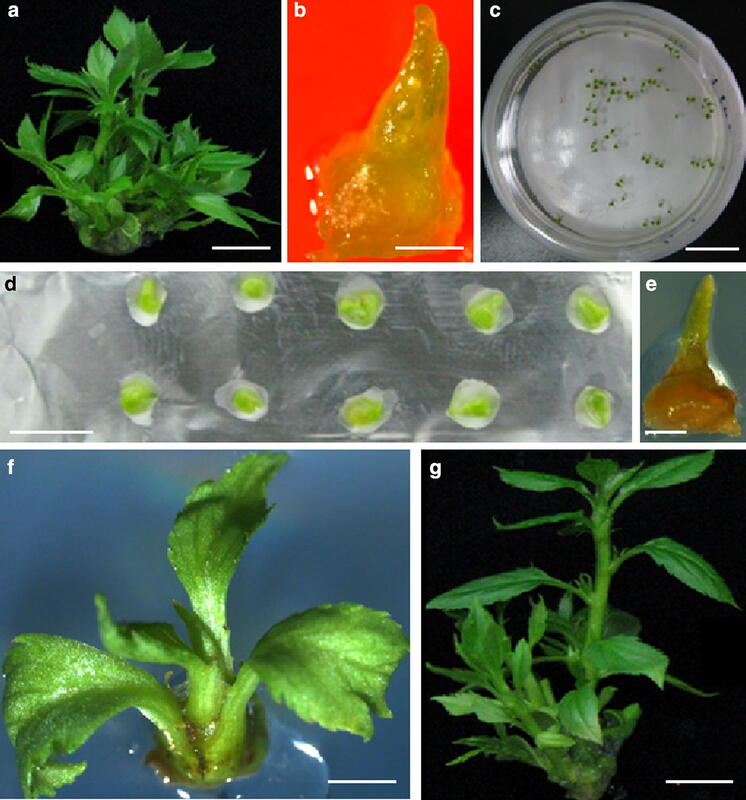 The use of the plant growth correction factor allows hypothetical shoot production from leaf-derived thin cell layers relative to conventional leaf explants to be determined. This updated review will allow novices and established researchers to advance apple and Malus biotechnology and breeding programs. The tissue culture of domesticated apple (Malus × domestica Borkh.) has a rich and extensive history spanning approximately 60 years (Dobránszki and Teixeira da Silva 2010). Since the apple genome is highly heterozygous, a consistent genetic background in a given cultivar can be maintained only by vegetative propagation, i.e., cloning. This would be important in the production of genetically uniform scions and rootstocks for commercial apple production. In nurseries, apple plants are produced by grafting scions onto rootstocks. The rootstock determines some important traits of grafted trees, including growth vigour, yield and resistance or tolerance to biotic and abiotic stresses (Rom and Carlson 1987; St. Laurent et al. 2010). The Cornell-Geneva (Geneva® series) breeding program has bred several dwarf rootstocks that are resistant to diseases and pests and are also cold hardy.1 Several of these rootstocks have been extensively researched in recent years (Tables 1, 2). Axillary buds (0.2–0.6 cm) for shoot proliferation. In vitro leaves (wounded by crushing) for shoot induction. In vitro culture establishment from dormant cuttings. In vitro shoots (10–15 mm, 3–5 leaves/bud) for in vitro propagation. MS + 2 μM 2,4-D (CIM). pH NR. 3% sucrose. 0.2% gellan gum. 2 w darkness → 16-h PP. 2000 lx. 25/16 ± 1 °C (day/night). Darkness. 25 ± 2 °C. 16-h PP. 2000 lx. 24 ± 1 °C. 16-h PP. 52 µmol m−2 s−1. 25 ± 2 °C. Epigenetic mutations can arise from the graft, resulting in altered fruit peel color (El-Sharkawy et al. 2015). In addition, bagging of fruits of a triploid cultivar ‘Mutsu’ was reported to induce epigenetic changes, as indicated by increases or decreases in DNA methylation and modifies levels of acetylation and trimethylation of histone proteins (Bai et al. 2016). One possible cause may be that a high proportion of the genome (57%) has transposable elements (Daccord et al. 2017). Epigenesis may lie at the heart of somaclonal variations that can arise spontaneously in vitro as a result of long-term culture or acclimatization (Gulyás et al. 2019 (unpublished)). This is an important issue as Webster and Jones (1989) discovered that increased cyclic shoot multiplication over a 21-month period induced rejuvenation of the in vitro cultured shoots of apple rootstock M9. In vitro culture may induce genetic variations, and thus an assessment of genetic stability is required for in vitro-based methods such as cryopreservation of plant germplasm, including apple (Wang et al. 2018a). Tissue culture thus continues to play an essential part of apple molecular breeding (Peil et al. 2011) and biotechnology. In vitro propagation of apple generally includes four stages, as in other plant species: (1) establishment of in vitro cultures from in vivo plants; (2) shoot regeneration and/or multiplication; (3) rooting of microshoots; (4) acclimatization of in vitro plantlets and the establishments of plant in an in vivo environment. The most frequently used explants in Stage 1 in apple in vitro propagation are shoot tips or axillary buds when propagated by axillary or terminal buds, or leaves when propagation is based on adventitious shoots (Fig. 1). Early studies were often hampered by tissue browning caused by oxidation of polyphenolics due to wounding during in vitro culture establishment (Dobránszki and Teixeira da Silva 2010). Reducing tissue browning is possible by timing the collection of explants, adding antioxidants to the culture medium such as ascorbic acid, activated charcoal (AC), or polyvinylpyrrolidine (PVP), singly or in combination, or the use of liquid culture or micrografting (Yepes and Aldwinckle 1994; Modgil et al. 1999; Dobránszki et al. 2000; Kaushal et al. 2005). Mert and Soylu (2010) found that timing of in vitro culture initiation and the use of axillary or terminal shoot tips affected medium browning during shoot regeneration, with a broad range of 10–84% browning across three rootstock cultivars, M9, MM106 and MM111. In Stage 2, the multiplication of shoots can be achieved by promoting the growth of axillary shoots or induction of adventitious shoots (Dobránszki and Teixeira da Silva 2010; Magyar-Tábori et al. 2010). Availability of a highly efficient plant regeneration protocol is a prerequisite for studies of apple genetic transformation (Bhatti and Jha 2010). A couple of factors have been known to affect the establishments of such protocols, including genotype, explant type, type and concentration of plant growth regulators (PGRs), medium composition and culture conditions (Dobránszki and Teixeira da Silva 2010; Magyar-Tábori et al. 2010). The objective of this review was to assess new advances in the literature related to the tissue culture of apple and Malus spp. that emerged between 2010 and 2018. There are a wide range of factors that need to be considered when disinfecting field- or ex vitro-derived plant material to be used as explants for in vitro culture, but some of the most important factors are genotype, explant type, disinfection procedure, age and physiological state of the mother plant and physical and chemical conditions applied in vitro (Teixeira da Silva et al. 2015, 2016a, b; Table 1). Paprštein and Sedlák (2015) reported 9% contaminated cultures for ‘James Grieve Compact’, 23% for ‘Jarka’, and 25% for ‘Mivibe’ and 2, 8 and 20% for ‘Rubimeg’, ‘Bohemia’ and ‘Primadela’ (Sedlák and Paprštein 2016), while Soni et al. (2011) noted that 8% of explants collected in summer were contaminated while explants collected in spring, autumn and winter showed 12, 32 and 54% contamination, respectively. These recent cases emphasize the importance of explant disinfection and contamination, even though many disinfection protocols are already available. Romadanova et al. (2016b) used 523 detection medium (Viss et al. 1991) to detect fungal and bacterial contamination in the in vitro culture of apple cultivars, clonal rootstocks and wild M. sieversii (Ledeb. M. Roem. ), finding 22% contamination in laboratory-grown shoots across all cultivars versus 56% in field-grown shoots. In their study, as would be expected, levels of contamination were inversely related to in vitro shoot development or viability, while infection levels decreased as the exposure time or concentration of HgCl2 increased. Malus plants contain high levels of polyphenols (Volz and McGhie 2011). Wounding often causes apple explant browning, eventually leading to death of the in vitro tissue when established in vitro. Several methods are available to efficiently reduce browning (Dobránszki and Teixeira da Silva 2010). Inclusion of 0.25% ascorbic acid, 0.5% citric acid and 3 g/l activated charcoal (AC) in the medium was found to reduce browning of apple rootstocks MM106 and MM111 (Jafarkhani Kermani et al. 2009) and ‘Douce de Djerba’ (Boudabous et al. 2010). Treatment of axillary and terminal buds in Murashige and Skoog (1962) medium (MS) containing 100 mg/l ascorbic acid reduced browning of apple rootstocks MM106, M7, MM111, M793 and M26 (Modgil and Thakur 2017). Adding 0.15 g/l citric acid and 0.1 g/l ascorbic acid into the medium was necessary to avoid explant oxidation when preparing leaf transverse thin cell layers (tTCLs) (Dobránszki and Teixeira da Silva 2011, 2013). Working on apple ‘Remo’, ‘Rewena’ and ‘Reanda’, Dobránszki et al. (2005a) reported the successful development of micrografts when shoot tips excised from field-grown plants were used, while use of in vitro shoot tips caused death of rootstocks, due to phenolic browning. Leaf segments are the most widely used explants to induce adventitious shoots in Malus spp. Adventitious shoots can be induced directly without callus formation (Pawlicki and Welander 1994) or indirectly through callus (Dufour 1990). Thidiazuron (TDZ) is more effective than N6-benzyladenine (BA) for shoot regeneration (Gamage and Nakanishi 2000; Dobránszki et al. 2004, 2006; Mitić et al. 2012; Li et al. 2014). The optimal TDZ concentration varies with apple genotypes (Fasolo et al. 1989; Sarwar and Skirvin 1997; Dobránszki et al. 2004, 2006; Magyar-Tábori et al. 2010; Mitić et al. 2012). Fasolo et al. (1989) noted that in three cultivars (‘McIntosh’, ‘Paladino Spur McIntosh’ and ‘Triple Red Delicious’) 10 μM TDZ induced shoots efficiently but other cultivars (‘M7’, ‘M9’, ‘M26’, ‘Orine’, ‘Golden Delicious’, ‘Melrose’, ‘Macspur’, ‘Strakrimson’ and ‘Fuji’) induced shoots when TDZ concentration exceeded 10.0 μM (Gamage and Nakanishi 2000; Magyar-Tábori et al. 2010; Mitić et al. 2012; Li et al. 2014), although the vast majority of remaining cultivars responded best when TDZ was applied at less than 5.0 μM (Sarwar and Skirvin 1997; Magyar-Tábori et al. 2010; Li et al. 2014). A number of cultivars such as ‘Royal Gala’ and ‘Dayton’ responded similarly to a wide range of TDZ concentrations (5–20 μM) (Magyar-Tábori et al. 2010). Protocols using TDZ to induce adventitious buds have recently been developed for several Malus species and genotypes (Li et al. 2014; Podwyszyńska et al. 2017). It is worth noting that TDZ has been reported to induce abnormal shoots in a wide range of plants (Dewir et al. 2018). Given the genomic instability of apple and apparent ease with which epigenetic changes take place, the use of TDZ is cautioned as there are some documented cases of TDZ-induced abnormalities in apple in vitro culture such as hyperhydric shoots (Fig. 2) and dwarfing, or shoot fasciation (Kereša et al. 2012), although the development of these phenomena depend strongly on the level of TDZ applied as well as the genotype used (Dobránszki et al. 2001, 2006; Magyar-Tábori et al. 2010). Mert and Soylu (2010) observed hyperhydric shoots in 38–45% of axillary shoot tips and in 31–38% of terminal shoot tips for rootstock M9, but almost no hyperhydric shoots in rootstocks MM106 and MM111 at the shoot establishment stage, but 75–100%, 1–3% and 9–100% hyperhydric shoots for M9, MM106 and MM111 axillary shoot tips, respectively, across three sampling dates (53–83%, 1–11% and 1–65% for M9, MM106 and MM111 terminal shoot tips, respectively). Shoot elongation is effectively achieved with the inclusion of gibberellic acid (GA3), but here, too, the needed concentration is genotype-dependent (Dobránszki and Teixeira da Silva 2010). In tTCL-based studies of apple, meta-topolin (N6-metahydroxy-benzyladenine; mT), an aromatic cytokinin was essential in pre-treatment for adventitious shoot induction, as was assessed for ‘Royal Gala’ (Dobránszki et al. 2005b) and ‘Freedom’ (Magyar-Tábori et al. 2010). About 5.6 and 8.0 adventitious shoots formed from the first and second leaves of in vitro shoots of apple ‘Royal Gala’, while the value was 2.1 from both leaf sources of apple ‘Freedom’ (Dobránszki and Teixeira da Silva 2011). 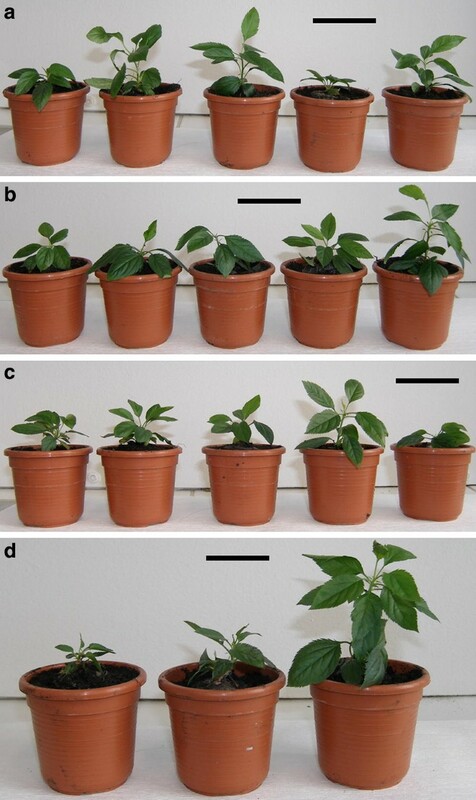 In the study of Dobránszki and Teixeira da Silva (2011), tTCLs formed significantly fewer shoots per explant than regular leaf explants: 3.2 and 2.7-5.1 for first and second leaves, respectively for ‘Royal Gala’, and 0–1.5 and 0–1.4 for first and second leaves, respectively for ‘Freedom’. This result is not unexpected when one considers the difference in explant size and surface area, but when the plant growth correction factor (PGCF) is considered, tTCLs can in fact form more shoots than regular leaf explants (Teixeira da Silva and Dobránszki 2014) (see Table 2 for details). Explant size, in particular the surface area, affected the quantitative outcome of adventitious shoot regeneration in apple, and the use of tTCLs resulted in several dozen-fold more shoots from a designated surface area once the PGCF was considered, i.e., relative to a regular explant, tTCLs have the ability to produce vastly more shoots (Dobránszki and Teixeira da Silva 2013; Teixeira da Silva and Dobránszki 2014) (see Table 2 for details). This makes tTCLs a preferred explant for adventitious shoot regeneration in apple although they can be laborious to produce due to their size. Scientists working on any aspect of apple tissue culture are alerted to the fact, as for many other plant species, that the timing of sampling (reflecting different developmental stages) impacts the quantitative outcome, primarily the number of adventitious shoots (Dobránszki and Teixeira da Silva 2013; Teixeira da Silva and Dobránszki 2013) (see Table 1 for details). Mehta et al. (2014) observed the same phenomenon, i.e., dependence of quantification of shoot and root induction on timing of sampling, for two rootstocks, MM106 and B9. As had already been reviewed (Dobránszki and Teixeira da Silva 2010; Magyar-Tábori et al. 2010), medium composition affects the success of both axillary and adventitious shoot induction. Ghanbari (2014) found that three dwarf apple rootstocks performed equally well in terms of shoot production, on MS medium rather than on woody plant medium (WPM; Lloyd and McCown 1980). However, Ciccoti et al. (2008), when studying the multiplication rate and shoot height of 11 apomictic genotypes of Malus sieboldii, found that the optimal basal medium was cultivar-dependent. MS medium was the best for six genotypes while QL (Quoirin and Lepoivre 1977) basal medium resulted in the highest multiplication rate for four genotypes and only one genotype performed optimally on DKW (Driver and Kuniyuki 1984) medium. In apple, the shape and orientation of the explant affects shoot productivity (Dobránszki and Teixeira da Silva 2010). Zhang et al. (2014) showed that cut-based wounding of leaf explants and their orientation with the abaxial surface down on the medium was important for adventitious shoot production, and 96% of explants formed shoots versus 39% when explants were adaxial surface down on the medium. The most important factor, which governs the in vitro development and growth of apple shoots, is the choice of PGRs applied in the medium (Dobránszki and Teixeira da Silva 2010). Amiri and Elahinia (2011a) showed how the choice of PGR, in particular the use of TDZ and 6-benzyladenine (BA), affected the outcome of shoot induction in three rootstocks, while GA3 was essential for shoot elongation (Table 2). In fact, the vast majority of apple shoot multiplication studies had employed either BA or TDZ (Yepes and Aldwinckle 1994). As in some earlier studies in apple, Castillo et al. (2015) found that TDZ caused explant and leaf deformation when used continuously for the tissue culture of apple rootstock CG41. The advantages and disadvantages of the application of TDZ have also been discussed above (see adventitious shoot induction in ‘In vitro propagation of apple’ section). Dastjerd et al. (2013) noted that effective induction and elongation of M26 rootstock shoots was only possible when the medium contained a combination of BA, crab chitosan and GA3. Curiously, the relative concentration of these three compounds could be used to manipulate the growth form in vitro, for example, to increase bushiness as a result of the production of more or less leaves or more or less elongated shoots, which has potential applications to ornamental in vitro cultures. That study reported for the first time the use of chitosan in apple tissue culture, indicating chitosan as a promising additive in tissue culture of woody species. 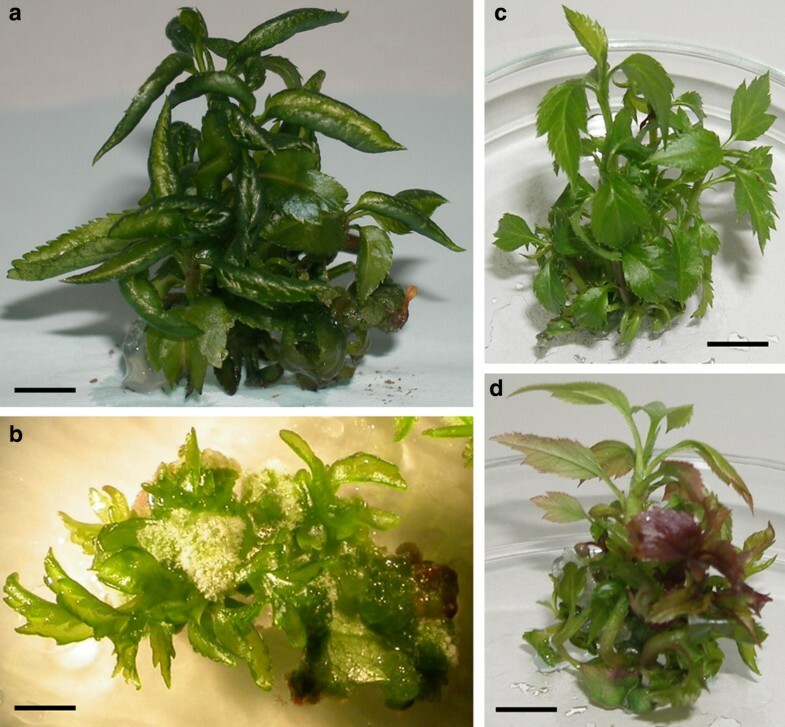 Chitosan has been widely used in orchid tissue cultures and has a wide range of biological properties, including antimicrobial and promotion of plant growth (Uthairatanakij et al. 2007). TDZ multiplied shoots more effectively than BA in eight Galician traditional apple cultivars, but its optimal concentration depended on the cultivar (Table 2; Lizárraga et al. 2017). However, the percentage of hyperhydric shoots was highest in five out of eight cultivars while in two cultivars (‘Ollo Mouro’, ‘José Antonio’), it exceeded 50% when TDZ was added to the shoot multiplication medium (Lizárraga et al. 2017). Geng et al. (2015) noted the importance of GA3 for shoot development in three rootstocks released from the Cornell-Geneva (Geneva® series) breeding program, depending on the light source, while red light induced significantly more shoots, and longer shoots, than when white or blue light was used, but this depended on the cultivar. Studying the effects of cytokinin supply (BA, BAR, mT and a dual application of BA + mT) on the quality of axillary shoots of apple ‘Royal Gala’ and ‘Freedom’, Dobránszki and Mendler-Drienyovszki (2014, 2015) noted that the choice of cytokinin affected the chlorophyll (chl) content as well as the functionality of the photosynthetic apparatus (maximum quantum yield Fv/Fm and maximum efficiency of the photochemical process, Fv/F0, light chl fluorescence, Y(II)) in the leaves of axillary shoots after three weeks of culture. The Fv/Fm values varied between 0.683 and 0.861 in ‘Royal Gala’ and between 0.709 and 0.790 in ‘Freedom’ corresponded to the chl fluorescence values measured in field-grown plants. The effects of cytokinins were genotype-dependent. Total chl content of leaves was highest when BA was supplied to ‘Royal Gala’ and when mT was supplied to ‘Freedom’. In ‘Royal Gala’, 0.5 µM BA or 2.0–25.0 µM BAR (Dobránszki and Mendler-Drienyovszki 2014), while in ‘Freedom’ the supply of two cytokinins (2.2 µM BA + 2.0 µM mT) favoured dark and light chl fluorescence measured in the third, developed apical leaves (Dobránszki and Mendler-Drienyovszki 2015). Kepenek and Karoǧlu (2011) increased shoot number/explant in rootstock M9 and apple ‘Starking Delicious’ and ‘Amasya’ when two growth retardants (paclobutrazol and daminozide) were applied, but shoots were stunted while there was no effect on rooting. The effects of antibiotics on shoot growth and development can be important when the objective is to produce transgenic plants. Stanišić et al. (2018), using the protocol of Mitić et al. (2012) for ‘Golden Delicious’, noted that when 300 mg/l cefotaxime was used, shoot growth improved, increasing shoot number per explant from 7.67 to 9.69 in the control, whereas other β-lactam antibiotics (meropenem and timentin) stunted shoot growth, a similar response that chrysanthemum and tobacco had displayed when several aminoglycoside antibiotics were tested (Teixeira da Silva and Fukai 2003). Pathak and Dhawan (2012b) found that the growth of rootstock M7 and MM111 shoots could be supported on medium containing between 1 and 5% fructose, glucose, mannitol, sorbitol and sucrose, with the most effective concentration resulting in longest shoots and greatest productivity arising from 4% sucrose and sorbitol for M7 and MM111, respectively. However, they did not assess the in vitro rooting in response to these five carbon sources. Their shoot-related results correspond to the well-known, special carbon metabolism of apple in which the main products of photosynthesis are sucrose and sorbitol (Cheng et al. 2005), as was described by Karhu (1997) for in vitro apple culture. The choice of carbohydrate affects shoot regeneration in herbaceous plants such as chrysanthemum (Teixeira da Silva 2004) and in apple (Bahmani et al. 2009), but can also affect rooting as in peony (Wang et al. 2012), an important issue for woody plants, which tend to be difficult to root in vitro. Pereira-Netto et al. (2012b) partially replaced agar with galactomannan and managed to increase shoot productivity several fold. The use of alternative gelling agents may be a way to reduce the cost of micropropagation (Purohit et al. 2011). When 50% of agar–agar was replaced by guar gum in the medium, the diffusion speed of the blend improved, the solidity and elastic character of the agar-guar gum blend decreased, its dynamic elasticity decreased to one-third of the agar gel and shoot multiplication rate increased to 8.9, while the rate of hyperhydric shoots decreased to 12% from 59% on agar gel (Table 2; Dobránszki et al. 2011; Table 2; Fig. 2). The in vitro rooting of apple microshoots can be induced using different auxins, such as indole-3-butyric acid (IBA, 0.3-3.0 mg/l), α-naphthaleneacetic acid (NAA; 0.1–1.0 mg/l) or indole-3-acetic acid (IAA; 1 mg/l) (Table 2). A series of methods were developed and the majority of them used a two-phase protocol for in vitro rooting (De Klerk et al. 1999; reviewed in Dobránszki and Teixeira da Silva 2010). It is widely accepted that auxin is necessary for root induction, but its continued presence in the medium inhibits the development of adventitious roots (Dobránszki and Teixeira da Silva 2010). Rooting of microshoots involves a short root induction phase (up to one-week long) followed by a longer root elongation phase (several weeks). IBA was frequently applied in the root induction phase, while NAA was mainly applied or an auxin-free medium was used in the root elongation phase (reviewed in Dobránszki and Teixeira da Silva 2010). IBA has been the most commonly applied auxin for rooting in different apple genotypes, with the rooting percentage varying between 18 and 100%, depending on the concentration applied and genotype (Table 2). The success of rooting also depends on the type of explant used for rooting: 63–90% of MM106 terminal shoot tips rooted compared to 69–74% from axillary shoot tips (Mert and Soylu 2010). In some cases (Modgil and Thakur 2017; Modgil et al. 2017), the combination of IBA and NAA was effective, such as 0.3 mg/l IBA and 1 mg/l NAA for EMLA111 rootstock. Modgil et al. (2010) achieved higher rooting percentage by using IBA (81–82%) than by using NAA (71%). Amiri and Elahinia (2011a) noted that the presence of IBA was essential for rooting three rootstocks (M9, M27, MM106), but only when the concentration of cytokinins was decreased, i.e., rooting performance increased when cytokinin level was decreased or when auxin level was increased. In contrast to this finding, Mehta et al. (2014) reported 98% and 92% rooting for MM106 and B9 rootstocks on PGR-free medium. In ‘Jarka’ and ‘Mivibe’, IBA was not an effective auxin to induce roots (8% and 1% rooting of in vitro shoots, respectively), rather 1 mg/l NAA and 1 mg/l IAA successfully induced rooting in ‘Jarka’ and ‘Mivibe’ (44% and 22%, respectively) (Paprštein and Sedlák 2015). A study by Lizárraga et al. (2017) on the in vitro propagation of eight traditional apple cultivars from CIAM (Centro de Investigaciones Agrarias de Mabegondo) Germplasm Bank in Spain effectively demonstrates the strong genotype dependence of cultivars in terms of their auxin demand for in vitro adventitious rooting. They noted that two out of eight Galician apple cultivars (‘Camoesa’, ‘Repinaldo’) showed the highest rooting percentage and root number when rooting medium contained 0.1 mg/l IBA, that two cultivars (‘Cacharela’, ‘Príncipe Grande’) rooted only in the presence of exogenously added IBA while one cultivar (‘Ollo Mouro’) developed roots only on auxin-free medium. One cultivar (‘Tres en Cinca’) did not develop roots either on IBA-containing or auxin-free medium (Table 2). When two strains (EEL16010B and EEL37810) of Rhizobia were used, 100% rooting of Marubakaido rootstock was achieved (Muniz et al. 2013). Podwyszyńska and Cieślińska (2018) found that the use of putrescine, a polyamine, when used in combination with NAA and IBA, was able to improve the rooting and subsequent acclimatization of neo-tetraploids of four apple cultivars, ‘Free Redstar’, ‘Gala Must’, ‘Pinova’ and ‘Redchief’ (more details in Table 2). Phloroglucinol (PG), a phenol derivative, has been successfully employed for the in vitro rooting of many plants including apple, a species that is generally considered to be difficult to root (Webster and Jones 1989; Sharma et al. 2000; Teixeira da Silva et al. 2013) and is as or even more effective than commonly used auxins (Dobránszki and Teixeira da Silva 2010). The effect of PG, however, depends on the genotype as described in earlier studies (reviewed in Dobránszki and Teixeira da Silva 2010; Teixeira da Silva et al. 2013). The combination of PG (162 mg/l) with IBA (2 mg/l) resulted in a significant increase in the rooting (from 5.5% up to 69%) of M.9 apple rootstock (James and Thurbon 1979). Webster and Jones (1989) achieved 93% rooting on in vitro shoots of M.9 rootstock when only 162 mg/l PG was added to the rooting medium, after 21 subcultures. The rooting percentage was 77% on PG-free medium, but only 69% when PG was added only to shoot-induction medium. Similarly, if PG was applied to rooting medium in the case of the Tydeman Early Worcester scion, rooting percentage increased from 50% in PG-free medium to 68% (Modgil et al. 1999). The opposite effect was detected in MM.106 rootstock when PG was applied to rooting medium because rooting percentage decreased to 53% on PG-free medium from 66%. However, PG applied to shoot proliferation medium had a favourable after-effect on rooting, increasing it to 81% (Sharma et al. 2000). Acclimatization of in vitro rooted microshoots can be achieved in a wide range of substrates such as vermicompost, coco-peat, sand and perlite, usually in a mixed ratio, while the use of arbuscular mycorrhizal fungi (AMF) has been shown to improve the acclimatization of in vitro-derived apple, mainly with endomycorrhizae from the Glomus genus, although, until 2010, only about half a dozen studies on apple had been published using AMF (Dobránszki and Teixeira da Silva 2010). In ‘Royal Gala’ leaf segments, the ability of adventitious shoots to root depends on the choice of cytokinin used in the shoot regeneration medium previously. No rooting was achieved if TDZ or a mT riboside (mTR) was used in shoot regeneration and rooting was only 10% and 25% after regeneration of shoots using regeneration media contained BA or a BA riboside (BAR), respectively (Magyar-Tábori et al. 2011). Therefore, to achieve a high percentage of rooting (76%), a four-week-long subculture on medium supplemented with 1 mg/l BAR as the source of cytokinin was necessary prior to rooting of newly developed shoots (Magyar-Tábori et al. 2011; Table 2; Figs. 3, 4). Shoots that had been rooted in vitro were successfully (80–100%) hardened in different substrates such as coco-peat, peat, soil: sand (3:1 v/v), a mixture of vermiculite and cocopeat, or in soil: vermiculite: perlite (1:1:1 v/v/v) (Table 2). Vettori et al. (2010) found that when a rhizobacterium (Azospirillum brasilense Sp245) was applied during the acclimatization phase, the biomass and stem weight of rootstock MM106 improved. In the study of Mao et al. (2018), cuttings were placed in IBA-containing medium then transferred to medium with BA after either 3 or 7 days. The analysis of roots indicated that endogenous auxin levels decreased while the genes related to auxin signalling were suppressed as were genes related to cell cycle in adventitious root formation in the 3-day group, but not in the 7-day group. This suggests that exposure to an auxin for at least 7 days cannot reverse the fate of adventitious root formation, even if a cytokinin is added to the auxin-containing rooting medium. The apparent key to the determination of adventitious root formation lies in the timing of the application of a cytokinin, either before, during or after the initiation stage of adventitious roots, which is between days 3 and 7 in apple (De Klerk et al. 1999). MdDRB1, a gene coding for a double-strand RNA-binding protein in apple, controls adventitious root formation in ‘Gala’ (You et al. 2014). Like other plant species, there may be genetic variation in plants derived from apple in vitro culture (Dobránszki and Teixeira da Silva 2010). Molecular markers are an effective method to verify the genetic stability of micropropagated plants (Kacar et al. 2006). The DNA amplification profile of molecular markers such as inter simple sequence repeats (ISSR) was very similar in in vitro-derived plants and mother shoots of rootstocks ‘MM111’ and ‘Merton 793’ (Pathak and Dhawan 2010, 2012a, c), and ‘Gala’ (Li et al. 2014, 2015). No genetic variation was found in ‘Gala’ plantlets derived from leaf segments (Montecelli et al. 2000) or from axillary buds of rootstock ‘EMLA 111’ (Gupta et al. 2009) when material was analyzed by random amplified polymorphic DNA (RAPD). Using RAPD, Viršcek-Marn et al. (1998) found no variation in leaf-derived plantlets of ‘Golden Delicious Bovey’ and ‘Goldspur’, Modgil et al. (2005) detected genetic variation in rootstock ‘MM106’ plants derived from axillary buds, while Caboni et al. (2000) detected polymorphism in leaf-derived ‘Golden Delicious Bovey’ and ‘Goldspur’ plants but not in plants originating from apical meristems of rootstock ‘Jork 9’. Modgil et al. 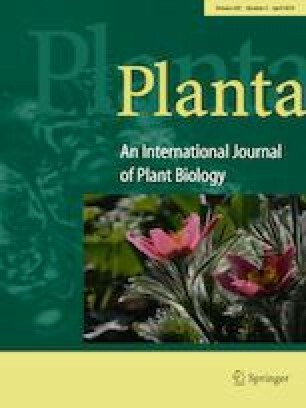 (2017) used RAPD to assess whether in vitro propagated M7 rootstock plantlets differed genetically from mother plants, claiming 0% polymorphism. In contrast, Noormohammadi et al. (2015), using ISSR, found significant differences between mother plants and in vitro cultured plantlets that had been grown on four different media, finding as much as 53% or 46% polymorphism in rootstocks M7 and M9. In the same study, select lines of M9 tissue cultured plants displayed a significant increase in genome size, as assessed by flow cytometry, with variation ranging between 1.35 and 4.12 pg in a comparison of 16 samples encompassing mother plants and in vitro clones of M7 and M9. Pathak and Dhawan (2012a) found 6% polymorphism in rootstock MM106 in vitro plantlets that had been subcultured over 4 years. Unlike Noormohammadi et al. (2015), Pathak and Dhawan (2010) found no genetic variation among two-year-old tissue cultured clones of rootstock MM111 when assessed by ISSR markers, nor in rootstock Merton 793 (Pathak and Dhawan 2012c). These data indicate that genetic stability of offspring can depend on genotype, explant type and shoot multiplication method, or the number of subcultures (Dobránszki and Teixeira da Silva 2010). However, the correct choice of molecular method is also an important factor in detecting genetic polymorphism, if there is any. Malus is an extensively studied plant genus in terms of cryopreservation of in vitro shoot tips (Wang et al. 2018a). Earlier studies mainly used two-step freezing (Katano et al. 1983; Kuo and Lineberger 1985; Stushnoff 1987) and vitrification (Niino et al. 1992; Wu et al. 1999). Over the past two decades, various cryopreservation protocols have been developed, including droplet-vitrification (Halmagyi et al. 2010a, b; Li et al. 2015; Poisson et al. 2016), DMSO-droplet (Zhao et al. 1999; Halmagyi et al. 2010b) and encapsulation-dehydration (Wu et al. 1999; Zhao et al. 1999; Paul et al. 2000; Hao et al. 2001; Kushnarenko et al. 2009; Feng et al. 2013; Li et al. 2015). Comprehensive information on cryopreservation of in vitro Malus plants can be found in recent comprehensive reviews (Benelli et al. 2013; Wang et al. 2018a). Therefore, this topic will not be addressed in the present review. In vitro culture is a successful method to eradicate apple viruses and detailed information on this subject before the twenty-first century can be found in several comprehensive reviews (Laimer and Barba 2011; Panattoni et al. 2013; Barba et al. 2015). Advances on this subject since 2000 reported improvements of in vitro-based methods for apple virus eradication, including thermotherapy (Paprštein et al. 2008; Hu et al. 2015b, 2017; Vivek and Modgil 2018; Wang et al. 2018b), chemotherapy (James et al. 1997; Paprštein et al. 2013; Hu et al. 2015b), combining chemotherapy with thermotherapy (Hu et al. 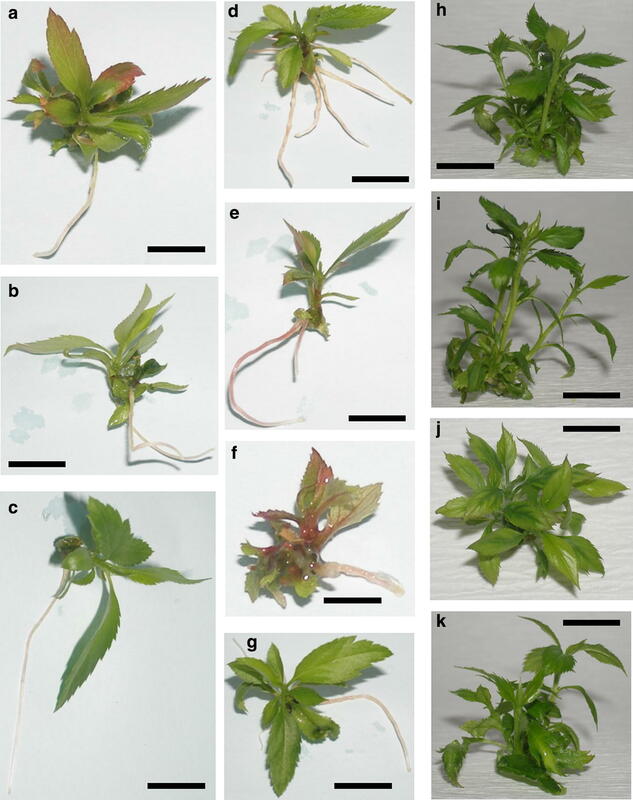 2015b), shoot tip culture from adventitious buds (Wang et al. 2016), cryotherapy (Li et al. 2016; Romadanova et al. 2016a; Bettoni et al. 2018) and combining thermotherapy with cryotherapy (Zhao et al. 2018) (Fig. 5). In thermotherapy applied to virus eradication (Paprštein et al. 2008), in vitro diseased shoots of two apple cultivars (‘Idared’ and ‘Sampion’) were thermo-treated at 39 °C for 6 days. Shoot tips (1–2 mm long) with 1–2 leaf primordia (LPs) were excised from heat-treated shoots and cultured, to regenerate shoots. About 63% of ‘Idared’ and 44% of ‘Sampion’ shoot tips excised from heat-treated shoots regenerated into shoots and no shoot tips survived when thermotherapy was applied for 10 days. Four of five clones of ‘Idared’ were free of apple chlorotic leaf spot virus (ACLV), apple stem pitting virus (ASPV) and apple stem grooving virus (ASGV), but no virus-free plants were found in ‘Sampion’, as analyzed by reverse transcription-polymerase chain reaction (RT-PCR). Hu et al. (2017) reported a thermotherapy procedure for apple virus eradication. Pot-grown diseased plants were heat-treated at 38 °C for 30 days. Shoot segments (1 cm long) were excised from heat-treated plants and surface-disinfected, followed by excision of the shoot tip (1 mm long) and cultured for shoot regeneration. With this procedure, the total level of survival and virus-free frequency (ACLSV, ApMV, ASPV and ASGV, analyzed by RT-PCR) were about 30% and 25%, respectively, across the five apple cultivars including ‘Yanfu 9’, ‘Xinyanfu 3’, ‘Huafu’, ‘Apple 123’ and ‘Zhengzhou no. 5’. In the study of Vivek and Modgil (2018), infected shoots were exposed to 37–40 °C for 4 weeks using hot air. Shoot tips (0.3–0.5 mm long) containing 1–4 LPs were excised from heat-treated shoots that had been surface-disinfected and cultured for shoot regeneration. This procedure resulted in about 26–32% shoot regeneration and efficiently eradicated ACLSV, ASPV, ApMV and ASGV from apple ‘Oregon Spur-II’. Paprštein et al. (2013) reported a two-cycle chemotherapy for apple virus eradication. Infected in vitro shoots (5–10 mm long) of apple ‘Fragrance’ were cultured for the first cycle (4 weeks) on medium containing 20 mg/l ribavirin then to medium containing 100 mg/l ribavirin for the second cycle (4 weeks). Shoot tips (3 mm long) containing 2–3 LPs were excised from chemo-treated shoots, and 100% of shoot tips developed shoots without any visible variation. About 35% and 65% of plantlets were free of ASPV and ASGV, but all plantlets were still infected with ACLSV, following the first cycle of chemotherapy. About 76% of plantlets were free of ACLSV, following the second cycle of chemotherapy. Ribavirin concentration higher than 40 mg/l was found to be phytotoxic to in vitro apple cultures (James et al. 1997; Hu et al. 2015). Genotype-specific responses to ribavirin concentration may be responsible for such differences (Paprštein et al. 2013). Combining chemotherapy with thermotherapy was recently reported to be more efficient than a single use of either method for apple virus eradication (Hu et al. 2015b). After virus-infected in vitro shoots of apple ‘Xinhongjiangjun’ were cultured for 40 days on medium containing 25 mg/l ribavirin and then subjected to heat treatment at 36 °C for 20 days, 1.0 mm-long shoot tips were excised and cultured, with ~ 90% shoot survival. Shoot regeneration levels and total virus elimination frequencies (ACLSV, ASPV and ASGV) were about 60% and 100%, and 94% and 100% in terminal and axillary shoot tips, respectively. These data indicate that virus eradication was more efficient when axillary shoot tips were used than terminal ones. Wang et al. (2016) attempted to eradicate ASPV and ASGV by culturing shoot tips derived from adventitious buds that had been induced from leaf segments. In that study, 0.24 cm2 leaf segments were excised from young terminal leaves of one-month-old virus-infected in vitro apple ‘Gala’ shoots and used to induce adventitious buds. Shoot tips (0.4 mm long) with four LPs were excised from 4-week-old adventitious buds and cultured for shoot regeneration. This procedure produced 82% shoot regeneration and 95–100% ASPV-free frequencies. However, none of the plants regenerated were free of ASGV. In many previous studies on shoot tip culture for apple virus eradication, only a single shoot tip could be harvested from each shoot from a stock plant (O’Herlihy et al. 2003; Paprštein et al. 2008; Sedlak et al. 2011; Li et al. 2016). In the study of Wang et al. (2016), three leaves from one stock shoot were used for the induction of adventitious buds and produced at least 24 buds, resulting in a much higher efficiency of bud production than previous studies (O’Herlihy et al. 2003; Paprštein et al. 2008; Sedlak et al. 2011; Li et al. 2016). Shoot tip cryotherapy can be used to eradicate viruses from apple. In a study by Romadanova et al. (2016b), shoot tips were excised from cold-hardened (22 °C for 8 h/day, then − 1 °C for 16 h/night, for 3 weeks) in vitro shoots and subjected to vitrification cryotherapy, as described by Reed and Yu (1995). Virus-free frequencies were 60–100% for ACLSV in six of the nine genotypes, 25–67% for ASPV in five of the six genotypes, 50% for ASGV in one genotype and 89% for ApMV in one genotype. Bettoni et al. (2018) successfully eradicated ACLSV, ASPV and ASGV from infected in vitro shoots of apple ‘Marubakaido’. Using the Feng et al. (2013) encapsulation-dehydration cryotherapy method, they achieved 72% shoot regrowth of cryo-treated shoot tips, 100% virus-free frequencies for ACLSV and ASPV and 90% for ASGV. Li et al. (2016) reported that encapsulation-dehydration cryotherapy could eradicate viruses from apple rootstocks ‘M9’ and ‘M26’. Shoot tips (1.5 mm long) with 3–4 LPs were excised from 1-month-old in vitro shoots and were cryo-treated using the encapsulation-dehydration method indicated by Feng et al. (2013). After cryotherapy, during post-culture, about 74% of ‘M9’ and 75% of ‘M26’ shoot tips regenerated into shoots after 8 weeks. About 80–85% of the regenerants survived, but none of them were free of ASGV in the two apple rootstocks. Histology indicated that many cells in the apical dome (AD) survived as did some cells in LPs 1–3, but cells in LP 4 and older tissue were killed or damaged following cryotherapy (Li et al. 2016). Immunohistological virus localization did not detect ASPV in the AD or in LPs 1–3, rather in LP4 and older tissue, bud found ASGV in the AD and in all LPs (Li et al. 2016). These data explained why shoot tip cryotherapy could efficiently eradicate ASPV but failed to eradicate ASGV. Although shoot tip culture produced higher rates of shoot regeneration (90% for ‘M9’ and 92% for ‘M26’) than shoot tip cryotherapy, none of the regenerants were free of ASPV in 1.5 mm shoot tips (Li et al. 2016). It is well-known that the size of shoot tips is critical for virus eradication in shoot tip culture (Laimer and Barba 2011; Panattoni et al. 2013; Barba et al. 2015). However, similarly high virus-free frequencies were produced in shoot tip cryotherapy, regardless of the size of shoot tips, thus enabling much easier handling of shoot tip cryotherapy than shoot tip culture (Wang and Valkonen 2009; Wang et al. 2009, 2014). Cryotherapy failed to eradicate viruses that are able to infect meristematic cells of shoot tips (Wang et al. 2008; Li et al. 2016). More recently, Zhao et al. (2018) reported thermotherapy followed by shoot tip cryotherapy for efficient eradication of ASGV. In that study, an alternating temperature (36 °C/32 °C, day/night) was applied to treat ASGV-infected in vitro shoots for 4 weeks. Shoot tips (1.5 mm long) containing 4 to 5 LPs were taken from heat-treated stock shoots and used for droplet-vitrification cryotherapy, according to Li et al. (2015). All shoots following thermotherapy survived. About 47% of shoot tips following thermotherapy and cryotherapy regenerated into shoots, and all regenerated shoots were free of ASGV. When applied to three other apple cultivars (‘Fuji’, ‘Ruixue’ and ‘Nongguo 25’) and apple rootstock ‘M9’, this procedure produced shoot regeneration levels ranging from 33 to 76% and ASGV-free frequencies ranging from 30 to 100% (Zhao et al. 2018). These results suggest that combining thermotherapy with cryotherapy may be the most efficient method reported thus far for plant virus eradication (Wang et al. 2008; Zhao et al. 2018). Polyploids can be induced by two mechanisms, mitotic polyploidization, which is based on the doubling of somatic tissues and meiotic polyploidization, which generates 2n gametes (Ramsey and Schemske 1998), which can be used immediately in crossing experiments, thereby reducing the breeding process by one generation. Murashige and Nakano (1966) reported the first in vitro polyploidization experiment in tobacco. In vitro plant propagation offers a great opportunity to improve the efficiency of chromosome doubling since in vitro cultures offer a more contained and standardized environment than greenhouse treatments. Some studies reported spontaneous chromosome doubling as a side effect of in vitro multiplication (Barow and Jovtchev 2007; Chen et al. 2009; Meyer et al. 2009). Podwyszyńska et al. (2016) examined the ploidy of 70 apple genotypes and found that polyploids had larger vegetative (stomata, leaves) and reproductive (flowers) characters, and fruits, suggesting that there is practical value to inducing polyploids in vitro. The polyploidization of apple in vitro has been achieved with colchicine and oryzalin (Bartish et al. 1999; Ou et al. 2008), but given the toxicity associated with the former (Spiller 2014), several polyploidization agents were compared by Podwyszyńska et al. (2017), namely colchicine, trifluralin, oryzalin or amiprophos methyl (APM). After 8 weeks of culture, tetraploids could be obtained in ‘Gala Must’ in response to 125 mg/l colchicine, in ‘Pinova’ in response to 125 or 250 mg/l colchicine, 100 mg/l trifluralin and 5 or 10 mg/l APM, in ‘Redchief’ in response to 125 or 250 mg/l colchicine, 50 mg/l trifluralin, 5 mg/l oryzalin and 5 mg/l APM, and in ‘Sander’ in response to 125 mg/l colchicine and 50 mg/l trifluralin. In that study, numerous mixoploids were also obtained when shoot explants were used for polyploidisation, but only sporadic occurrence of mixoploids was observed when leaf explants were used. The kind of antimitotic agent and its concentration as well as cultivar influenced explant viability and shoot production (Table 2). Apple in vitro culture has been used to test for biotic stress resistance/tolerance, including to diseases, since the 1980’s. Similarly, resistance/tolerance to drought and salt stress were studied in in vitro apple shoot cultures (reviewed in Dobránszki and Teixeira da Silva 2010). Bahmani et al. (2012) noted that a high salt concentration (> 100 mM NaCl) inhibited the growth of MM106 in vitro shoots and decreased the number of regenerated shoots, rooting percentage and root number while a low NaCl concentration (20 mM) significantly increased shoot length and fresh weight. In vitro apple callus cultures serve as excellent systems for testing abiotic stress and for assessing the molecular mechanisms underlying this process, through an understanding of gene expression and function. Yao et al. (2011) used apple ‘Orin’ in vitro plantlets, callus and suspension cultures to understand the role of the MdcyMDH (Md = Malus × domestica) gene, which codes for cytosolic NAD-dependent malate dehydrogenase, a key enzyme in malic acid synthesis, in growth and responses to two abiotic stresses, salinity and cold. The latter is important to understand since apple and other Rosaceae plants accumulate dehydrin proteins in response to cold stress (Haimi et al. 2017). An et al. (2016) scratched a part of the surface area of leaf margins of ‘Gala’ in vitro plantlets with a blade to induce wounding. In a separate stress treatment, tissues (presumably leaves) were transferred to medium containing 100 mM methyl jasmonate. Both stress treatments activated a homolog of the Arabidopsis thaliana MYC2 gene, MdMYC2, which encodes a transcription factor, and increased its expression levels, suggesting the importance of this gene in jasmonic acid (JA) signalling. MYC2 is mainly a positive regulator of abscisic acid signalling (Lorenzo et al. 2004). An et al. (2016) also used 10 day-old ‘Orin’ callus, which was transformed with Agrobacterium tumefaciens. Both over-expression and antisense constructs were introduced and callus in the former were red, having genes related to anthocyanin biosynthesis over-expressed while the latter had under-expressed genes, indicating that MdMYC2 plays a role in JA signalling. Meng et al. (2016) found that ‘Orin’ callus grown on solid medium or liquid medium (i.e., water-logging stress) showed a differential expression of 34 WRKY genes, which code for transcription factors, and that the expression level of 127 MdWRKY genes had a much higher level of expression in callus (as much as 2- to 10-fold) than in shoot tips, leaves and fruit of ‘G.41’ rootstock trees that had been micropropagated and grown in a greenhouse. WRKY proteins regulate gene expression and are involved in cell signalling and JA-mediated plant immunity in response to pathogens (biotic stress signalling) and abiotic stress (salinity, drought, heat, freezing) signalling (Eulgem and Somssich, 2007; Phukan et al. 2016). Hu et al. (2016) found that the MdSOS2L1 (coding for a calcineurin B-like protein (CBL)-interacting protein kinase, MdCIPK24-LIKE1) gene positively improved salt tolerance in apple ‘Gala’ by increasing the level of antioxidant metabolites such as procyanidin and malate after interaction with three calcineurin B-like proteins, MdCBL1, MdCBL4 and MdCBL10. Meng et al. (2018) developed two antisense lines (A4, A10) of apple ‘Greensleeves’ and ‘Orin’ in which the ALDOSE-6-PHOSPHATE REDUCTASE (A6PR) gene was suppressed, making plants more susceptible to the fungus Alternaria alternata. A6PR oversees the conversion of glucose 6-phosphate to sorbitol 6-phosphate and sorbitol results from the dephosphorylation of sorbitol 6-phosphate by sorbitol-6-phosphate phosphatase. Using tissue-cultured plants, when one nucleotide-binding/leucine-rich-repeat (NLR) gene, MdNLR16, was overexpressed in the antisense lines, resistance to A. alternata increased. Apple ‘Royal Delicious’ was used as a novel bioassay to assess the amount of browning and polyphenol oxidase activity in response to bacterially synthesized volatile organic compounds (Gopinath et al. 2015). A γ-proteobacterium (Luteibacter rhizovicinus MIMR1) that had originally been isolated from contaminated in vitro cultures of ‘Golden Delicious’ (Piagnani et al. 2007) produced high levels of IAA (127 mg/l), inducing roots in barley (Hordeum vulgare L.) tissue cultures, suggesting that this apple-derived plant growth-promoting bacterium could serve as a biofertilizer (Guglielmetti et al. 2013). Muniz et al. (2013) isolated 20 strains of Rhizobium from the root nodules of a legume, Adesmia latifolia, and found that they produced 13–51 mg/l of IAA, the highest by strain EEL16110, although another two dead strains, EEL16010B and EEL37810, induced rooting in 100% of in vitro shoots of Marubakaido apple rootstock, equivalent to when 1 mg/l IAA, was used. Using the protocol developed by Ciccoti et al. (2008), Giorno et al. (2013) and Guerriero et al. (2013) developed an in vitro assay for ‘Golden Delicious’ to better understand the pathogenesis-related genes involved in infection of plantlets by ‘Candidatus Phytoplasma mali’. Giorno et al. (2013) found that the content of glucose, fructose and sorbitol was lower while the content of sucrose and starch was higher. Guerriero et al. (2013) found that cellulose and callose synthase genes involved in cell wall biosynthesis were up-regulated. Verardo et al. (2017) used callus cultures derived from pulp tissue for producing important secondary metabolites such as phloridzin and triterpenic acids. A key objective of apple tissue cultures is to multiply pathogen-free clones, as evidenced in the past decade by extensive studies about virus eradication using several methods. In vitro techniques are very costly since skilled manual labour is needed, as is specific equipment and the high price of plant material, so the effectiveness of the in vitro protocol should always be optimized, and improved, where possible. Several technological developments that have been reported in the past decade include the application of additives such as crab chitosan, phloroglucinol and methods such as tTCls or alternative illumination (red light) in a bid to improve the growth response and productivity of in vitro plants. Growth retardants and antibiotics were also tested with varying success during shoot multiplication, while microorganisms such as bacteria and fungi were shown to enhance the acclimatization of apple. Micropropagation of pathogen-free in vitro apple shoot cultures is a vegetative process and clones have to be true-to-type, although epigenetic modifications can appear easily, possibly due to large-scale transposable elements in the apple genome. Tissue cultures provide a very good method and basis for physiological and genetic studies in apple, and the genes controlling adventitious root formation, genes involved in responses to abiotic/biotic stress and the genetic stability of in vitro cultured apples have all been summarized in this review. The primary role of cytokinins in adventitious shoot regeneration has still room for improvement because the most effective type and level of cytokinin will depend on the apple genotype and ineffective concentrations might lie very close to effective concentrations, so a small deviation from the optimum may cause an adverse effect in vitro. Cytokinins can also affect the functionality of the photosynthetic apparatus. Similarly, the effect of auxins in the rooting process has also been extensively studied in apple. Important interactions were detected in in vitro experiments but the responses to a wide range of treatments or conditions were often genotype-dependent. Biotechnological methods also allow the storage of germplasm and help breeding work by methods such us polyploidization. There is very little available literature about somatic embryogenesis in apple in the past decade. In fact, somatic embryogenesis in Malus spp. is lacking. All authors are co-corresponding authors. All authors contributed to the intellectual discussion underlying this paper, literature exploration, writing, reviews and editing, and accept equal responsibility for the content. Open access funding provided by University of Debrecen (DE). The research was financed by the Higher Education Institutional Excellence Programme of the Ministry of Human Capacities in Hungary, within the framework of the Biotechnology thematic programme of the University of Debrecen (20428-3/2018/FEKUTSTRAT). The study and submission for publication was approved by the University of Debrecen (BPTR/DEENK/0003/2018). The authors declare no conflicts of interest of relevance to this topic.